This famed Payne edition of Select Works of Edmund Burke is universally revered by students of English history and political thought. Volume 1, Thoughts on the Cause of the Present Discontents and The Two Speeches on America, contains Burke’s brilliant defense of the American colonists’ complaints of British policy, including “Thoughts on the Cause of the Present Discontents” (1770), “Speech on American Taxation” (1774), and “Speech on Conciliation” (1775). 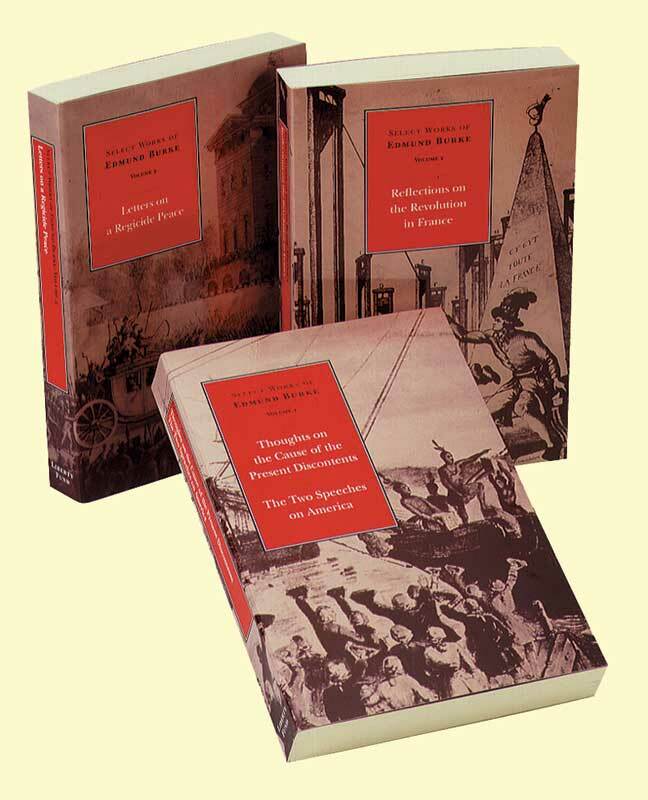 Volume 2 consists of Burke’s renowned Reflections on the Revolution in France. Volume 3 presents Burke’s Four Letters on the Proposals for Peace with the Regicide Directory of France—generally styled Letters on a Regicide Peace (1795–1796). The Letters, Payne believed, deserve to “rank even before [Burke’s] Reflections, and to be called the writer’s masterpiece.” Faithfully reproduced in each volume are E. J. Payne’s notes and introductory essays. Francis Canavan, one of the great Burke scholars of the twentieth century, has added forewords and a biographical note on Payne. In the companion volume Miscellaneous Writings, Canavan has collected seven of Burke’s major contributions to English political thinking on representation in Parliament, on economics, on the political oppression of the peoples of India and Ireland, and on the enslavement of African blacks. The volume concludes with a select bibliography on Edmund Burke. Francis Canavan (1917–2009) was Professor of Political Science at Fordham University from 1966 until his retirement in 1988.